Which Brands Get Real-Time Right? The number of brands engaging in real-time marketing has exploded recently, but not all of them are doing it well. Examples of real-time marketing success from three brands that do it right. More and more brands are aiming to engage around the events, stories and trends that their customers care about—in other words, more brands are engaging in real-time marketing. More brands might be doing it, but not all of them are necessarily succeeding. This shouldn’t come as a surprise; real-time can demand that marketing teams operate completely differently from how they’re used to—the content creation cycle is compressed down to minutes rather than months. Structuring teams for effective real-time marketing and putting in place processes necessary to be fast and maintain quality standards when pushing in the moment messages to your fans takes work. 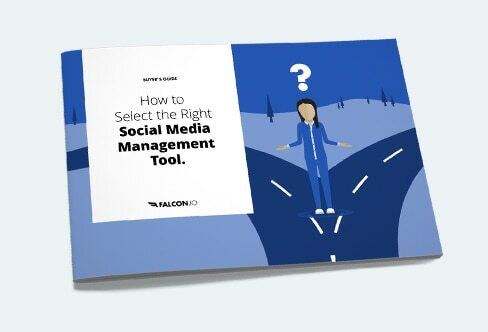 For an in-depth look at the fundamentals of good real-time marketing, download Falcon Social’s handbook here. Here’s a look at three brands that do real-time marketing well, and at what makes these examples of real-time marketing stand out. Netflix has gotten significant traction from messages around a bunch of different real-time events. They are in a strong position for building a social media audience: People love their product to the point of binging on it. Second, they, like some other entertainment brands, sometimes drop news that people are very eager to hear—like the premier date for the new season of a favorite TV show. And they manage these advantages intelligently, especially in real time. They play off people’s affection for shows, they know the characters in their shows, and they insert them in real-time conversations. They showed their smarts with an atypical real-time marketing play at this year’s Academy Awards. Instead of engaging directly with the event, they chose to release a new trailer for their biggest hit, House of Cards, during the ceremony. While not every brand could get away with this, Netflix can, and it got major results, making them the most talked about brand during the event. They also managed to inject themselves into the world cup conversations better than many brands. When Luis Suarez helped himself to a bite of one of Italy’s defenders, Netflix shot back with this, making the connection between devouring a tv show (generally considered okay) and devouring an opponent on the pitch (less okay). Don’t worry #Suarez, four months is plenty of time to devour House of Cards. One bite at a time. Kit Kat scored a major real-time coup with a single tweet. This quip ended up as the most retweeted brand tweet of all time. That message, poking fun at Apple for the pliability of the iPhone 6+, did resonate widely, but it’s not all Kit Kat has managed in terms of real-time marketing. They’ve practically developed their own style just for real-time marketing messages. Simple and funny, and always delivered with a straight face, you can see why content like their video of sending a Kit Kat into space (at the time when Felix Baumgartner was waiting to jump from the stratosphere with Red Bull) got so much attention. They were even real-time marketing before it became widespread—in 2010, these posters about the longest tennis match ever played were made and put up around Wimbledon immediately after the match. The copy, have a break, works on two levels—the players deserve a break, because they played for what seems like days, and they’ll finally have one, because John Isner broke his opponents service to win. Priceline made the most noise during last year’s Super Bowl with a set of live vines about the ads in the match. They created sped-up version of major ads, getting themselves in on the conversation without spending millions for a TV spot. But it’s not just the puppets that makes Priceline worth emulating. As a travel brand, it is natural for them to engage on social about events and holidays. They do a good job of mixing entertainment content, and, when it works, promoting their own products in conjunction with an event. If the message is really relevant, or a promotion is tied to an event, pushing sales content in real time can lead to real results.